Ricky Bobby, also known as Bob, is no ordinary cat - though his foster mother, Sweet Pea, didn't seem to mind. Bob is a wild bobcat, while Sweet Pea is your average domestic feline. Yet chance brought the two together, with Bob finding comfort and nourishment from her just when he needed it most. A local woman found Bob all alone the day after a storm in early May. 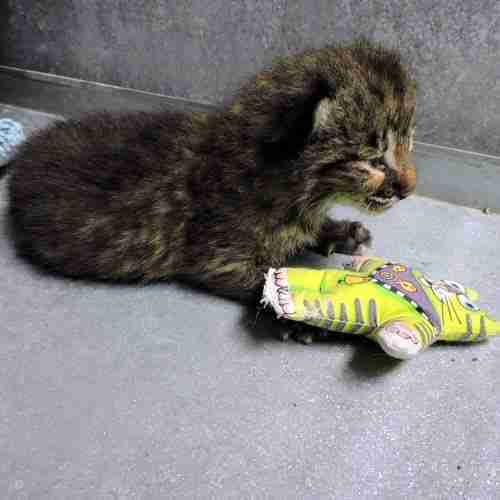 She then brought the kitten to the Haywood County Animal Shelter in North Carolina, where Erica Chacon, animal care manager for Sarge's Animal Rescue Foundation, happened to be dropping by. 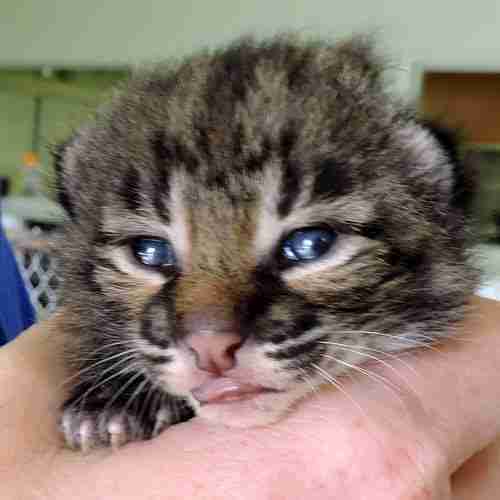 Chacon knew that Bob, who was just a few days old, needed a mother to nurse from in order to have his best shot at survival - and one feline at her rescue came to mind immediately. 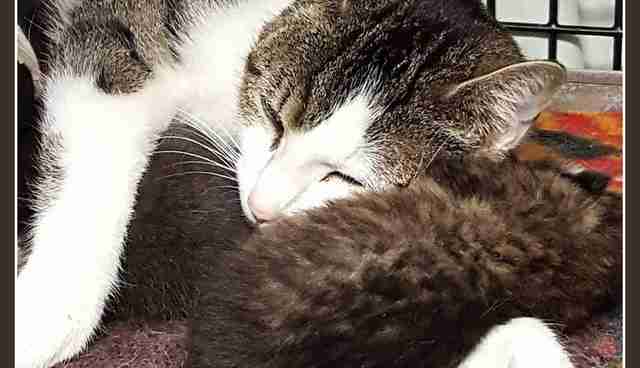 Sweet Pea, who was found as a stray, had been been surrendered to Sarge's that same day, along with her kittens, by the person who found her. The timing was perfect. "She had five kittens of her own at the time," Chacon told The Dodo. "So it was nothing to her to add another one. She didn't think anything of it." Within 15 minutes of meeting, Chacon said, Sweet Pea allowed Bob to nurse from her without any issues. Charon made sure to check and see if this was truly the right course of action for Bob's well-being. "The day I got [Bob], I contacted our local wildlife biologist and told him about the scenario," Chacon said. 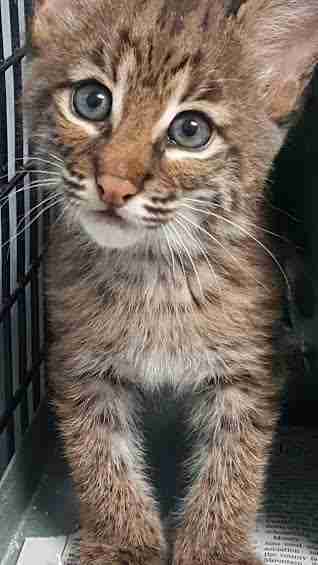 "He said that was the best scenario that could happen because bottle-feeding a bobcat for that long, you'd never be able to release him back into the wild." Throughout Bob's stay at Sarge's, he was inseparable from his foster mom. Chacon said that she was even more affectionate toward Bob than her own kittens, given that they stayed together longer. 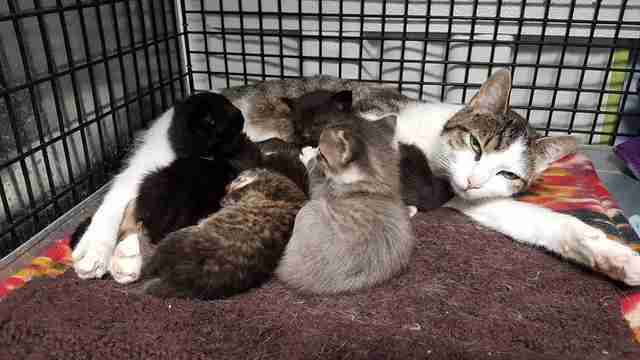 Sweet Pea's kittens were weaned first since they were older than Bob, while Bob continued nursing from Sweet Pea for about a month longer. Last Friday, Bob departed from Sarge's, and from the foster mom who saved his life, to head to a wildlife rescue. 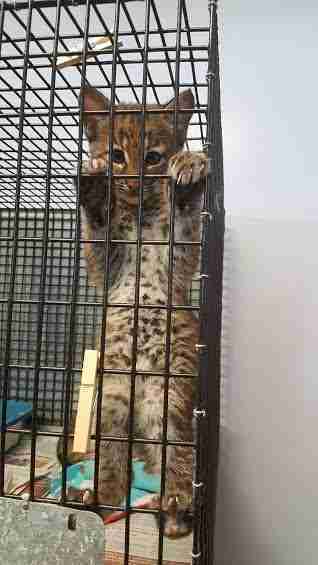 The hope is that he'll be able to be released back in the wild. "She just adored him and he adored her," Chacon said of the rare experience between the two cats. "It was amazing." Want to help Sarge's continue doing good work for animals in need? Consider making a donation here.